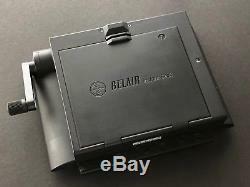 Lomo Belair Instax Wide back for Polaroid 600SE mount. 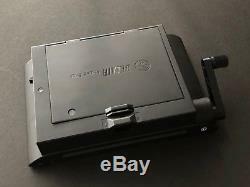 Mount it to your Polaroid 600SE or Polaroid Pathfinder 110A or 110B with 600SE mount body. This is the ONLY back available now for MONTHS. I decided to recover the back part with some faux ostrich skin I had sitting around the studio. Switch on side works like this. When you want to eject a shot, push lever up to #2 position. Use the hand crank to eject and develop. Before shooting again, bring lever back down to #1 position. Attaches and locks as any of your standard film backs. Everything is as original looking as possible. Light tight all around and tested for accuracy. A note about the MUP vs 600SE systems is the lenses. All three 600SE lenses (75, 127, 150mm) will cover Instax Wide no problem and no vignetting. Besides those same lenses for the MUP, only lenses with P in the name. Will cover Instax Wide without slight vignetting in the corners of one side. 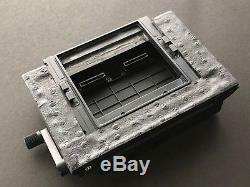 If you are mounting this to a Polaroid 600SE, you MUST modify the inside of your camera for full frame. 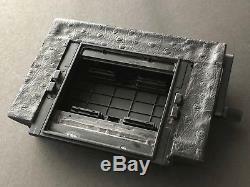 As shown in the photos, you'll have to remove the bottom rib. This will NOT affect using anything else with your camera. 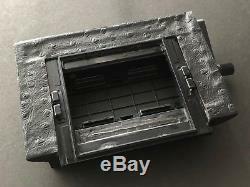 The item "Fuji INSTAX WIDE Belair Holder Back Polaroid 600SE 110A 110B Lomo Belair" is in sale since Tuesday, September 11, 2018. This item is in the category "Cameras & Photo\Vintage Movie & Photography\Vintage Cameras\Instant Cameras". The seller is "stinger3141969" and is located in San Antonio, Texas. This item can be shipped worldwide.